Before Cosme landed in NYC, the words creative and Mexican food didn’t seem to make the news. After tasting Mexican celebrity Chef Enrique Olvera’s creations, you understand all the buzz. Unforgettable dishes and flavors made my last dinner with Terry foodjournies.com (before her trip around the world and move to SF) that much more memorable. What a delicious way to end a chapter with a foodie friend. Like abc kitchen, abc cocina is a beautifully decorated space within abc carpet & home store. Jean George plays with latin flavors, while adding his own twist. Flavorful tapas and small plates style menu, meant to be shared. Doyer Street (Chinatown) is one of those interesting alleys that’s short but full of surprises. Nothing is what it seems. It can be a bit shady and creepy at times, but unlike the old days, it is quite safe. 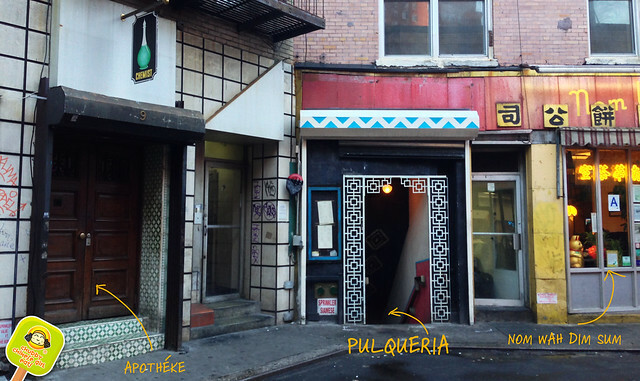 Without any signs, the hidden underground Mexican joint Pulqueria is tucked between Apotheke (speakeasy bar) and Nom Wah Tea Parlor (the oldest dim sum spot in NY). They claim to be the first restaurant outside of Mexico to batch and serve pulque (fermented beverage made from the agave plant). Part cantina/bar, part restaurant serving plenty of drinks, tortas and tacos, Mexican street market style.